So let´s get into detail: imagine you have two layer maps, named cats and dogs. Multi layer maps now allow you to easily create a third layer map animals which shows all markers from the layers cats and dogs. 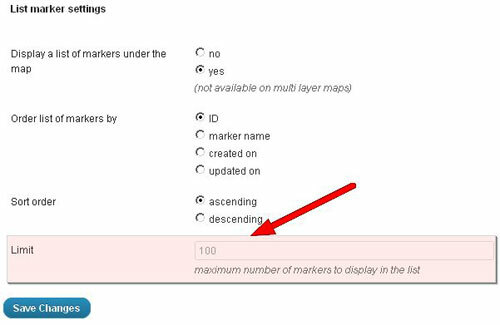 This gives you a much higher flexibility when dealing with a large number of markers. markers cannot be added directly to a multi layer map – you have to add markers to a regular layer and then add this layer to a multi layer map. 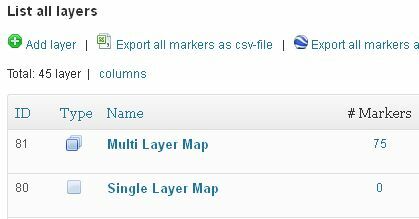 Dynamic preview on admin backend is not supported – please select the layers you would like to use on the multi layer map, click save and then the edit button again in order to display the multi layer map with the markers from the assigned layers. Please note that you can use this feature to also easily create a map with all markers you have added to your blog – just check the option “display all markers”. Another feature suggestion was made by padimails and this was really quite easy to implement: the use of custom marker icons for Wikitude augmented-reality browser. Initially I thought this was not possible, as this was not mentioned in the offical specs. So I asked the CTO of Wikitude, Martin Lechner, who informed me how to add this feature. The default value is set to 100, please change accordingly to your needs. David Ramí­rez, http://www.hiperterminal.com, was so kind to contribute a Spanish translation of the plugin. This translation is based on v1.4, so some text strings will still be English. An updated translation for v1.7 will be added when available. I also added width & height-attributes to the custom marker icons-<img>-tags on marker edit pages. This should speed up admin page load especially on Safari (thanks again Niko for the hint).